Go ahead and take the bait! Free today, but wanted to also say: wow…talk about a great cover, huh? Makes me wanna slap my momma. 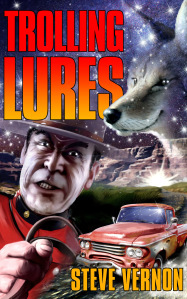 Okay – so my short novel TROLLING LURES is available for free today and tomorrow. Check out the cover from talented cover artist KEITH DRAWS. Trolling Lures asks and answers just what exactly would happen if the Trickster Coyote of native mythology ran into a Norse Troll, fresh out of Asgard. Here’s what some folks are saying about TROLLING LURES. Thanks for the re-blog, John. The cover was definitely slap-your-momma brilliant. If your readers want to check out the tricks behind making that cover give a listen to the talented KEITH DRAWS over at the Kobo Writing Life blog. That is pretty cool man, thanks for the link. Seriously folks, check it out.